The answer is simple. You should be learning the patterns behind all Russian grammar. Period. Do that and you’ll be light-years ahead of everybody who still struggles with it. Watch this video to see how it works. Thanks for writing. Glad you liked that PowerPhrase (mnemonic) (Tean in CHina). 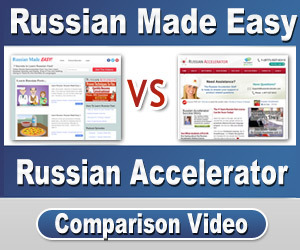 both in the podcast and in my online, Russian Accelerator course. Thanks for asking, and let me know how you do in the podcast’s final exam. I just wanted to thank you. I am using your podcase meanwhile for 6 weeks and am able to fluently follow your lessons. I couldn’t find something comparable in internet in German (I am from Germany). So for me it is a bit difficult because I have to listen in english but learn russian. However. Your system is that great, that I have no trouble to follow. Really unique. I have been teaching langauges in Ireland for 25 years and have just started Russian with your podcast. You are such an excellent teacher. I am learning not just Russian from you, but how to teach. I love the podcast and feel I’m making good progress. Thanks so much for the kind words. And so glad you’re enjoying my podcast. Anyway, I hope you’ll check out Russian Accelerator. It’s my online, video course.